This archive holds all posts form July 27, 2010. In recent weeks there have been a series of attacks against Mexican immigrants on Staten Island, a borough of New York City. The police are currently investigating another possible hate crime that occurred around 5:00 p.m. on Friday night. News reports say that a 31-year-old Mexican man was walking home from playing soccer at a local park when he was attacked by five men yelling anti-Mexican slurs. There is something of a history of hate crimes against Mexican immigrants on Staten Island. In 2008, a man living in the Port Richmond area of Staten Island took out his racism-fueled anger by driving his truck into store fronts he believed were owned by Mexican immigrants. This kind of violence directed toward a particular group can be attributed, at least in part, to the anti-Mexican and anti-immigrant rhetoric that is becoming more pervasive in the current political climate. Evidence of this hostile climate is as close as the nearest Google search. Type in the keyword “Mexicans” and get the suggested “Related search: I hate Mexicans.” Also, note the racist images that generated just on the search for “Mexicans.” This sort of rhetoric is not only created by those on the (supposed) lunatic fringe of society, but by some mainstream news media talking heads as well. This kind of hostile environment – in speech, in images – eventually leads to action that affects real human beings. There are ways to stand up against this sort of violence and intolerance. The folks at Change.org have launched a website based on anti-racist actions, called Not in Our Town. The site is dedicated to empowering people to fight back against hate and intolerance in their communities. When attacks like these occur, revealing a dangerous atmosphere of hate, it’s up to everyone to denounce that hate and violence and work toward building a community that is safe for everybody. 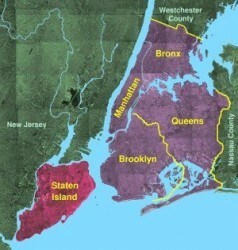 UPDATED 8/5/10: Another person has been attacked on Staten Island. A young man, Christian Vazquez, 18 who volunteers at with an anti-violence organization, was kicked and punched to the ground by assailants allegedly yelling anti-Mexican slurs. The attack was the 11th bias incident in the Port Richmond area since April. Some New Yorkers continue to stand up and speak out against this anti-immigrant, anti-Latino violence, as in the recent “Night Out Against Crime” event.